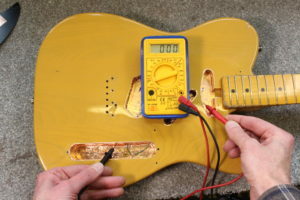 Shielding a Telecaster is a relatively straightforward procedure. But why do we need to do it and what are the benefits of doing so? You could also ask why it is that Fender don’t routinely shield all Telecasters and Stratocasters? If we look at this Telecaster we can see that there is no shielding in the cavities. 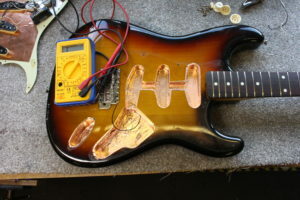 If there was we would see copper tape, or more commonly found in guitars made by big companies, black conductive paint. How can I tell if my guitar is not fully shielded? Try this: Plug you guitar into an amplifier and listen for any constant buzz or hum that is coming from the amp. Then touch the strings or the bridge and see if the hum largely disappears. If it does, then the chances are that your guitar would benefit from being fully shielded. Why does a guitar hum or buzz? In short, your guitar is picking up electromagnetic interference (EMI) from surrounding electrical equipment and sending that signal to your amplifier. If you want a full explanation of this process I suggest you watch this video. Single coil guitars are more prone to suffer with this problem, humbuckers less so. (hence the name hum-buckers). In my workshop I have fluorescent strip lights. They really make some guitars buzz and hum. So I know that if a guitar is quite in my workshop, it will be quiet in most situations. So how does shielding help to reduce the hum? If the shielding is done correctly we create what is referred to a “Faraday Cage”. Essentially we are enclosing components of the guitar to block out electromagnetic fields. Again, you can find a full (and no doubt better) explanation of this process elsewhere. Here is a Telecaster that I have shielded. The cavities and the underside of the pickguard have been lined with copper tape. 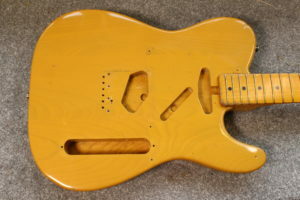 With four cavities to line, shielding a Telecaster can be a fiddly job. It is important that all the shielding is electrically connected. To do this I solder jumper wires between each cavity. I then test that I have continuity with the multi-meter. A reading of 0 is good! 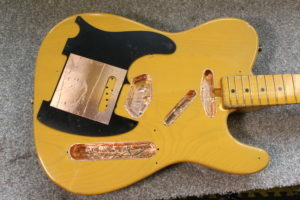 So what are the benefits of shielding a Telecaster? Well, I think there are three benefits of shielding a Telecaster. You get rid of (or greatly reduce) that annoying hum. You can overdrive the amp or use distortion without simply magnifying the hum. The guitar sounds cleaner and many people think the guitar just sounds better. So can the same shielding process be applied to Stratocasters? Absolutely! I recently shielded two Stratocasters. Once done, they were both as quiet as a very quiet church mouse! Here is a photo of one of them. So try that test I mentioned earlier to see if your guitar is shielded properly. If you think that your guitar has excessive buzz or hum I am happy to assess it or give you a quote to shield it.